(Office of Her Majesty – Press Department – Al Balqa) - Her Majesty Queen Rania Al Abdullah joined hikers in the village of Rmeimeen on Wednesday to take part in the Jordan Trail’s second annual Thru-Hike, which she hailed as an exceptional addition to the Jordanian tourism map. Spanning over 650 kilometers, the Jordan Trail stretches from Um Qais in northern Jordan to the southern port of Aqaba, and was named one of National Geographic’s top 21 destinations to visit in 2018. Throughout the 44-day Thru-Hike, hikers experience the country’s vast natural diversity by making their way across the entire trail or joining for shorter excursions along the way. 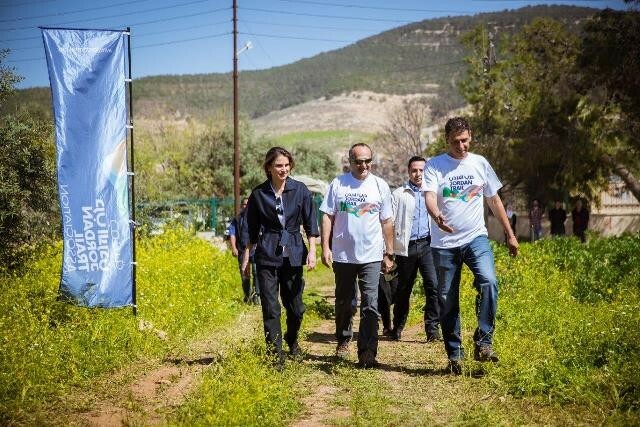 After she was received by Jordan Trail Association (JTA) President, Dr. Ramzi Tabbalat, and General Manager, Bashir Daoud, Queen Rania joined a group of approximately 30 local and international hikers for a walk through the village. In a meeting at the group’s campsite near the village church, Her Majesty was briefed on the development of the Jordan Trail and the progress made since last year’s inaugural event. She also heard from a group of local service providers, who explained how the Jordan Trail has benefited tourism in their areas, generated income for local households, and improved their readiness to welcome international tourists. Her Majesty thanked JTA team members and local service providers for their efforts, expressing her pride in the trail as a world-class national tourism project. She also attributed the success of the project to its comprehensive nature, making it an example to be followed. The Jordan Trail passes through 52 villages and towns, creating opportunities to support economic development across the country. Building on the nation’s deep-rooted hospitality, community members within participating villages provide services including homestays, campsite logistics, and tour guide services, creating jobs and benefiting previously overlooked areas on the socio-economic level. Designed by and for Jordanians, the Jordan Trail is developed and managed by the JTA, which is responsible for carrying out the trail’s sustainable development. The Thru-Hike, which kicked off on March 1, 2018 under Her Majesty’s patronage, was launched in cooperation with the Ministry of Tourism and Antiquities, and will conclude in Aqaba on April 12, 2018.